ALBUM covers have been around for almost as long as anyone can remember. Some make bold statements, some convey a more alternative look and some even present thought-provoking images that you would expect to see in an art gallery. Indeed, they come in many different forms. However, the main point of an album cover is to provide an image which “represents the artist’s music”. That is what links it to the field of public relations and professional storytelling. If you’re a regular reader of Holyrood PR blog posts you will no doubt have heard this before: strong professional images make a massive difference when it comes to gaining media coverage. Such images not only catch the eye and engage the reader. They can also fire the imagination in much the same wat that a memorable album cover can. Some album covers have mad a major and lasting cultural impression. Pink Floyd’s Dark Side of the Moon led to questions like “what does it actually mean?” or “what even is that? There isn’t a moon in that picture, let alone the dark side of one”. Yet it’s still an iconic piece of album art. Whenever they see that black triangle with a white line going in one side and a multi-coloured line coming of the other, most people instantly think of Pink Floyd. It’s the same with Abbey Road by the Beatles. Four people walking over a zebra crossing. Madness’ One Step Beyond album cover is another which often evokes an instant reaction. 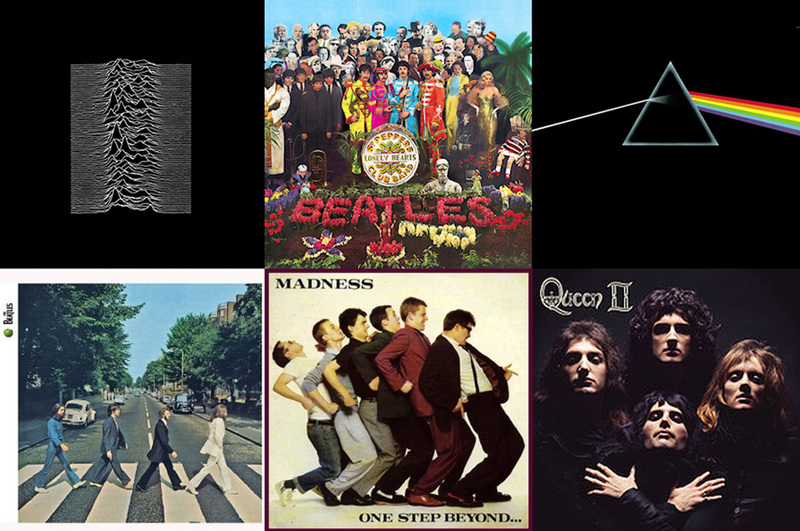 So simple, so basic, but yet both of these albums images have been recreated many times, by many different people. They’re iconic because they’ve been branded to be that way. All these albums that stick out in people’s minds. But why is this? It may be because certain people buy them, listen to them and pass them on and they continue to be passed on down the generations so many people have seen it. Or it may be that the bands that are writing the music are very good artists themselves and the album artwork doesn’t matter as much because the music is good. Or maybe it’s a clever way to get a point across that supports the music. What seems certain is that these covers wouldn’t be as memorable if it had not been for the involvement and creativity of a photographer or sketch artist. What we can take from this is that a good picture and a great story go hand in hand to deliver a more positive result. An image in a newspaper is designed to help you visualise the story that you are reading, it gives that little bit extra to make what you are reading more dynamic. Like album covers it comes down to a striking image. Having a visual aid with a well written story is always the winning combination and if it makes the reader think further about the topic afterward then that’s even better. The power of photography is an amazing thing. We understand how much photography makes a difference and is well worth the extra spend. In fact, we’ve even won a sought after silver award for our use of photography. Photography has helped create a positive ‘visual impact’ for all of our clients, by ensuring their stories were told more widely and positively with creative, engaging images. And the photography doesn’t just have to end there. The images that you use for the release don’t just have to be used for the release. Our clients use them on their website share them on social media and in various other internal and external comms. The good news is that at Holyrood PR we specialise in working with businesses to deliver affordable photography. The kind of photography that can be used in multiple ways – by helping you get media coverage while also enlivening your websites, brightening your brochures, powering up your newsletters and enriching your social media presence. Check out our essential business guide to picture perfect photography, which might just help your company to stand out above your rivals. This guide is packed full of useful hints and tips. We don’t want your pictures gathering virtual dust on a server – we want them being used,viewed and shared as widely as possible. And we enthusiastically practice what we preach – check out the pics we got of the Holyrood PR team as they took on the gruelling Total WarriorChallenge in September this year. Find out how your business can benefit from affordable-yet-powerful PR photography? Contact our expert PR team below to find out just how we can help commemorate your special event. Kallan Glynn joined Scottish public relations agency Holyrood PR as part of the Government-approved QA Apprenticeships scheme. It means he is learning the ropes from an expert PR team.